Increasingly, DC's workforce is comprised of either high-income or low-income jobs, with few middle-income jobs available. Among DC’s most common occupations, 40% are low wage jobs that do not pay enough to cover the city’s high housing prices. The most common occupation in the District of Columbia is, unsurprisingly, lawyer. This is also the most well-paid occupation in the District, where attorneys average about $161,900 per year. The least well-paid of the 20 most common occupations are waiters and waitresses, who earn just under $25,000 annually, on average. Top 20 DC occupations by Area Median Income (AMI), 2017. Red lines mark 50-80% AMI range. Source: Bureau of Labor Statistics, May 2017 State Occupational Employment. 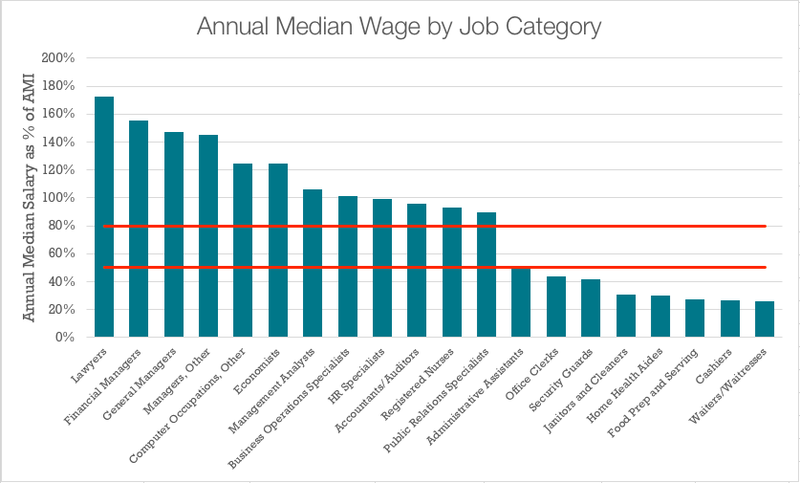 To evaluate what housing is needed for the city’s workforce, we identified DC’s most common occupations and median annual earnings, then matched those results to housing cost burdens. Eight of the most common 20 occupations pay less than $48,000 a year. Five of the top 20 jobs pay at or below $29,000 per year, which is considered extremely low income for a two-person household. Strikingly, not a single one of the most common 20 occupations in the District was between 50 and 80% of area median income. Many of the fastest growing service jobs in the District – home health aides, food preparation, and waiters/waitresses – earn extremely low incomes. At these income levels, working households face severe housing cost burdens, paying more than half of their income to housing (see figure below). 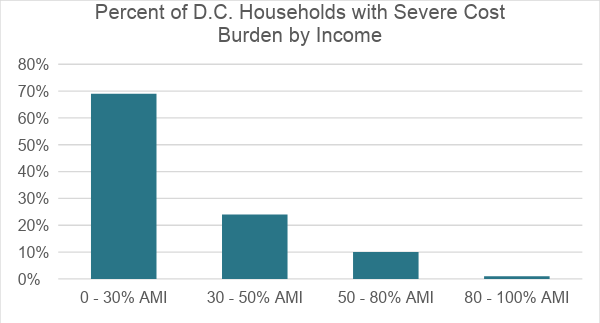 DC households with severe housing cost burden (paying more than half of household income for housing). Source: National Low Income Housing Coalition, "The Gap," March 2018. Few households earning above 80% area median income face severe housing cost burdens where they are paying more than half of their income to housing. In contrast, a large share of households below 50% of area median income, and the great majority of those at the 30% of area median income level pay most of their income toward their housing costs. These data show that the District’s greatest workforce housing need is not for those earning 80% of area median income and above. Rather, the housing most needed in the city for workers is for those who earn below 50% of area median income. Increasing the supply of workforce housing is a worthy goal. Helping workers live near their work offers broad benefits by shortening commutes, reducing traffic, pollution, crashes, and wasted time. It also helps foster a more resilient, growing economy. As the District considers income targeting for its housing assistance programs, the data suggest that subsidy dollars for “workforce housing” should be targeted below 50% area median income, rather than at 80% or above. Without this assistance, it will be difficult to create and retain housing for the District’s workers who are increasingly saddled with severe cost burdens. Read the Coalition for Smarter Growth's full report: Making Workforce Housing Work.